In Comics Scene (Vol.1) #6 (November 1982 cover date), George's name pops up in an ad for publisher Fantaco Enterprises, Inc. They list a bunch of comics available for mail-order; the listing that caught my eye was for Gates of Eden #2. I asked George about this comic at the recent con in Toronto, and he said he did not contribute a story for it. During the 'Sketch-Off Duel' : George Perez displays his work-in-progress sketch of Wonder Woman, while Michael Turner works on his own sketch of the amazing Amazon. 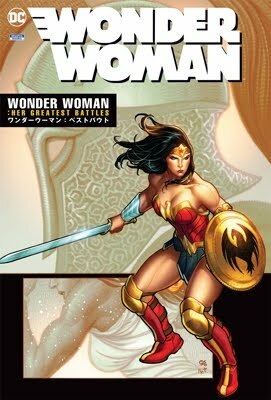 For my full write-up of the 'duel', check out the Wonder Woman-themed Pacesetter #6! At the 'Drawing Avengers' panel: George shows us how he draws capes. I believe that's Spawn on the left, Robin in the middle and a fan giving rise to Batman's cape on the right. At the 'Drawing Avengers' panel : George showed us what he basically drew as his cover rough to get editorial approval for the cover of JLA/Avengers #3. The final cover may have caused his injury, but getting the approval was a breeze - he just drew the direction that the characters would be going in, and then added the words 'Lots of characters'. George Perez has been drawing comic books for nearly 30 years, and the industry’s version of an A-list Hollywood idol. He said he doesn’t do as many appearances as he would like, but enjoys every minute he spends with his fans. “In a job that is so incredibly solitary, since I work alone in the studio, it’s always nice to get the feedback. The rush of enthusiasm the fans have, you don’t really get to see that behind a drawing board,” Perez said smiling. On Saturday alone, he spent over 4 hours signing autographs, several more sketching for charity, and another hour leading a discussion about his art. More good news - as George Perez announced at the National Comic Book Expo in Toronto, Garcia-Lopez will be pencilling a project which Phil Jimenez is writing and Perez will be inking. I believe Perez referred to the trio of creators as 'EZ Company' because of their last names. Perez also mentioned in a panel that he's always been in awe of Garcia-Lopez's work. He said, while laughing, that when he saw Jose's work on The New Teen Titans many years back (a book which Perez was known for), he was afraid DC would just keep Garcia-Lopez and never hire Perez to work on the characters again. Perez also mentioned that the quality of Garcia-Lopez's work has always inspired him to be a better artist. And I believe I read somewhere that the Simone/Garcia-Lopez/Janson JLA arc will likely see print in the new JLA: Classified series. George Pérez showing us the differences between Cap and Supes in the 'Drawing Avengers' panel at the Canadian National Comic Book Expo. George Pérez sketching Zatanna at the ACTOR booth at the Canadian National Comic Book Expo. Unfortunately there wasn’t a panel with Perez -just a workshop on drawing the Avengers - but I couldn’t talk about the other guys above without mentioning something about George Perez. And this is what I have to say: the guy is the best. I have been going to comic conventions for about five years now and I have never met a creator as cool and as nice as Perez. Now most guys are fine, and a few are really cool (Quesada, Palmiotti, Romita Jr., etc.,) but I don’t think I’ve ever met anyone quite like Perez. First off, he was a good half an hour EARLY to his autograph session. People were lined up outside the autograph room doors and he began signing books for people as they waited in line. Then when we were let in, he sat at his table and told stories and jokes for everyone to hear as he signed books. He was also very warm and talkative with every single fan. I told him how cool I thought it was that he was such a nice guy and that he came early and everything, and he said that he liked to do whatever he could for the fans. Most creators say that, but I believed him more if only because I actually witnessed his kindness. Later on I decided that even though it was expensive, I would go ahead and make the $50 donation to A.C.T.O.R. and get a sketch from Perez. Once again he was very cool, talkative, and nice to everyone in line as he sketched. Always making jokes and making sure everyone left happy. As I waited in line I debated with myself over what I wanted to get from him…Superman? Batman? A Batman/Superman/Wonder Woman? Nah, it wouldn’t be very detailed. In the end, you guessed it, I ended up going with Wonder Woman. I might as well since he is THE definitive artist for her . . . and boy am I glad I did. I’m a bit ashamed to admit it, but I think I’m in love with his Wonder Woman sketch. I just can’t stop looking at it, it’s so beautiful! I’ve met many great creators over the years and I have to say that George Perez is by far the nicest guy out there. If you ever have the chance, talk to him. You will leave with a smile on your face, and really, what’s better than that? These are the George Pérez schedule, available on Hobby Star's website. Assemble! This is an opportunity of a lifetime for budding artists and fans to learn the secrets from the man himself! Perspective, Style, Background, and most importantly, Story-telling will all be all be covered in this amazing workshop. I am from Toronto and was elated that Geore Perez was doing the con. After 25 years, finally getting the chance to meet him and get an autograph and sketch was a dream come true. I took my JLA/Avengers hardcover to get an autograph. I was taking my daughter down as well, and about 15 mins from reaching the downtown con on Sunday, some lady rear-ended me. We weren't hurt, but by the time the police/tow truck came, and my wife to pick us up....well...we never made it. Do you know of any other con's that George is doing this year. I was really looking forward to getting a autograph and a sketch of kid flash. Anyways, thx and great site. Well, another Toronto Comic Book con. has come and gone. First impressions? It was the best yet. Everything seemed to gel all at once very well. At least for Alison and me. The high lights were meeting and schmoozing with comic book artist great, George Perez. He proved to be one of the nicest guys in the business bare none! I met him on Friday during the autograph session and gave him a set of our mini-series "The Sorcerer's Children," vol. 1. He was very appreciative and flattering of it. I told him Alison and I were in Artist Alley selling our 'stuff' and that, if he had time, Alison would love to see and meet him if he'd like to stop by some time. Whenever I invite someone to stop by, I always hope for the best but, understanding they often have very little time to spare while at the con., I don't really expect them to stop by. And when Friday came to an end, no George. Saturday morning, after setting up our table for a new day of selling, Alison and I were sitting behind the table when this kind-looking and very familiar person was suddenly standing before us. Yup! George Perez! He came right to our table in Artist Alley to see us and meet Alison and me. We chatted for about 5 minutes--which was pretty good since he had to get some where by the start of the hour. He was funny, very energetic, polite, and truly giving. Naturally, I got a picture of Alison and him together behind our table. I got a snapshot with him the day before. Later that day, we also got a sketch of Devin (one of our main characters from "The Sorcerer's Children") done by George. It cost a pretty penny but all the money went to the charity ACTOR. It was worth it. George proved to be a true class-act. whats going on Sunday and how much are tickets? "Marvel Super Panel" featuring Joe Quesada, Mike Deodato Jr., Steve McNiven, David Finch & C.B. Cebulski. "Drawing Covers With Michael Turner"
"The Art of Writing" featuring Brian Azzarello and Jill Thompson. Tickets are $20CDN for a single day. Dunno if they discount the last day. If you plan on getting tickets, be sure to line up around 8-9am. By 11am today, the line up was freakin huge!!! Glad I got advanced tickets, and arrive early. At the Canadian National Comicbook Expo in Toronto, Canada I finally got my chance to meet the great George Perez. I waited in the lineup during his autograph session with my 2-year-old son Kaelan, feeling a little like I was back in high school and an awkward kid (I'm 31 now). Suddenly, the power goes out! Everyone is a lttle shocked, but Mr. Perez in true professionalism and not to miss a beat yells "..and George Perez is still signing!" Unfortunately, my son did not like the dark so much, so I was forced to leave. After attending the rest of the show and a little disappointed that I missed my chance to meet George, I happened to take an alternate route back to where my beautiful (and patient) wife Tina was watching our son. Lo and behold - there is George doing charity sketches at $50.00 a pop (for A.C.T.O.R.). I ran to my wife and we joined the line. Shortly thereafter, a lady who was working with Georgegave a "Last in line" sign for the lady standing behind me - whew! I had just made it and now there was just a matter of waiting. For the next 2 hours, I watched George endear himself to fans, make jokes and work on some beautiful art. When it was finally my turn, I went with a Hawkeye headshot, a character I have enjoyed by Mr. Perez for decades (wow, I am getting old!). He silently performed his magic, but with a smile on his face. (At this point, I was the second last person after a long 3-day convention - I was surprised he didn't nod off!) Afterwards with a warm handshake he thanked me (!) sent me on my way. I was happy to see that everything I had heard about George was true. He is a class act.